Seven boys, their friends and families evaluate the changing nature of feelings, behaviour and this crazy thing called love. From the New York Times best-selling author of Every Day, another thoughtful and original perspective on the things we do for love. 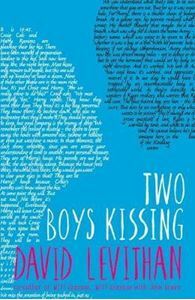 The two boys kissing are Craig and Harry. They're hoping to set the world record for the longest kiss. They're not a couple, but they used to be. Peter and Neil are a couple. Their kisses are different. Avery and Ryan have only just met and are trying to figure out what happens next. Cooper is alone. He's not sure how he feels. As the marathon progresses, these boys, their friends and families evaluate the changing nature of feelings, behaviour and this crazy thing called love.